In our experience, the Super X-Fi seemed to tickle us most with older, unspoiled music. The older the better. Mono recording? Even better. For example, an Amazon-downloaded Hank Williams’ Jr. MP3 of “Angels Are Hard to Find” (recorded in 1974) sprang to life with Super X-Fi, where the only thing that could possibly make it better was a hay bale and ice cold Lone Star beer. When it comes to gaming, your experience is likely to be better with games from studios that put a ton of resources into their sound teams, such as DICE and Blizzard—we found the Super X-Fi to shine bright here. 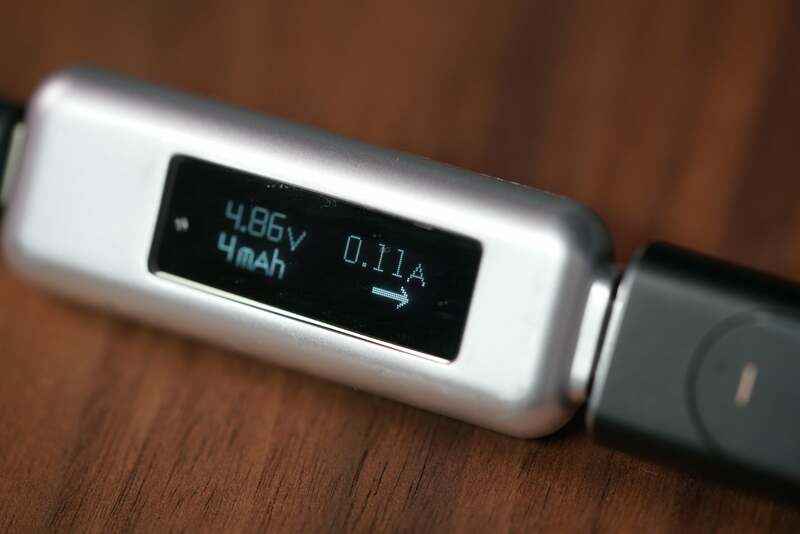 We found that the Super X-Fi typically used just a little less than half a watt of power under load, which didn’t seem to hit the phone’s battery life much. That’s not bad, but the Google USB-C audio dongle is even less at a 10th of a watt, so there’s a power cost. If you saw “MP3” and did a needle-scratch, stop. Yes, most audio snobs will turn up their noses at MP3s the same way a coffee enthusiast recoils at the mention of Folgers, and that condescension is warranted. MP3s are inherently compromised. Interestingly, we found this to be one of the areas where the Super X-Fi really shows its stuff. For the vast majority of average folks who have boxes of MP3 files they collected in college from that corner store called Napster, the Super X-Fi can, and will, make many of those files sound better. Obviously, your mileage will vary depending on the MP3 and how processed it was from the studio, but by and large, it improved most of the music we listened to. That’s not to say the Super X-Fi won’t make FLAC files also sound better. A 24-bit, 96KHz recording of the Eagles singing “Hotel California” sounded so much improved, that even Jeffrey Lebowski would likely approve. 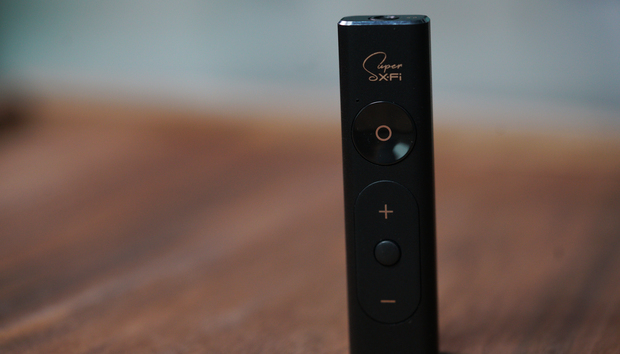 The large round button on the Super X-Fi lets you turn off any processing, making the dongle a standard USB Audio DAC. The LED turns green when processing is on and orange when it’s off. 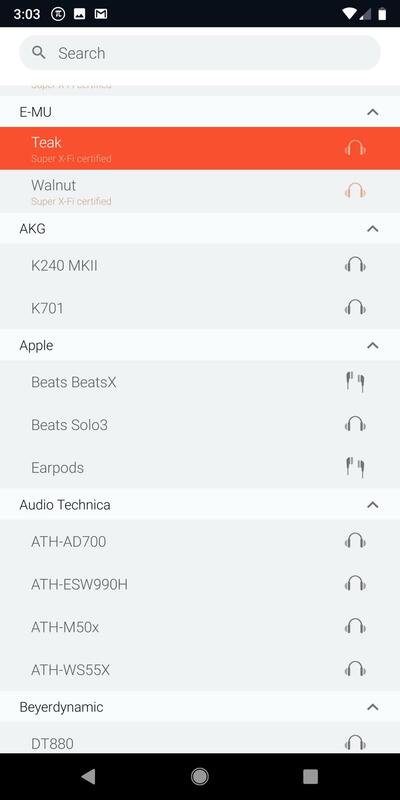 As we mentioned earlier, in addition to profiling your head shape, the Super X-Fi’s app also uses a profile for your specific headphones. 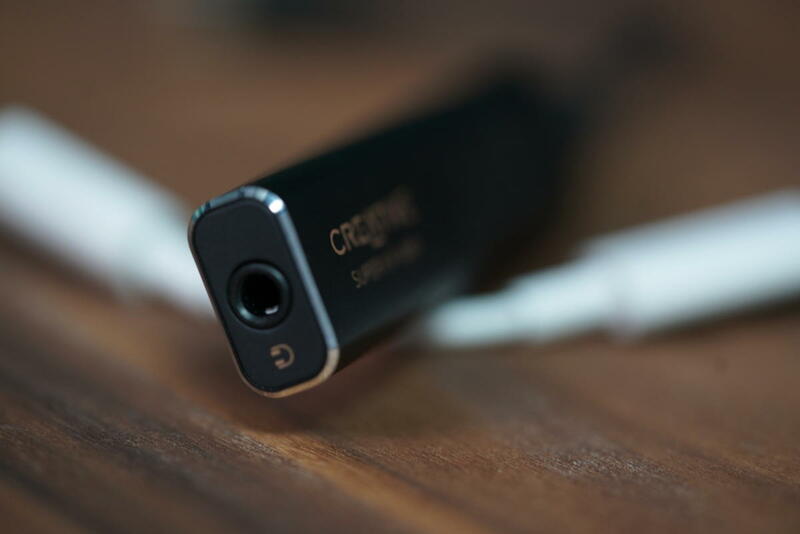 The list includes several major brands in addition to Creative’s own models, such as AKG, Apple, Audio Technica, Beyerdynamic, Bose, HIFIMAN, Jaybird, Koss, Massdrop, Oppo, Sennheiser, Shure, Skullcandy, Sony, V-Moda, and Venture Electronics plus its own Creative and E-Mu models. All told, there were 43 headphone models supported at the time of our review, with more to come. (Generic profiles exist for models not on the list.) For our testing, we used Creative’s $850 E-Mu TeaksRemove non-product link, $150 Aurvana TriosRemove non-product link, and a set of Aurvana SE’s that go $59. All had Super X-Fi profiles but we also used a pair of unprofiled Mionix Nash 20 gaming headphones as well as a set of Polk headphones and Sennheiser HD700s. The Nash 20 and Polk’s used the generic profile while the Sennheiser HD700s used the very similar Sennheiser HD800 profile in the app. Does the headphone quality matter? Yes, definitely. While there is some overall “enhancement,” don’t expect the Super X-Fi to make your lousy headphones sound great. Still, we were pretty happy with the results from the Aurvana SE’s that sell for $60. And a generic profile shouldn’t be a deal breaker. In fact, the Sennheisser HD700’s sounded great. Just don’t expect a magical transformation from subpar cans. 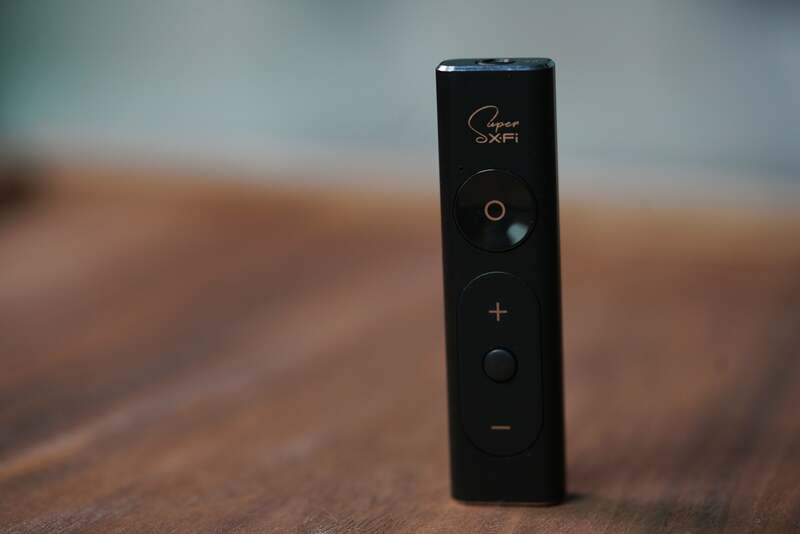 Creative has added 43 different profiles at last count that the Super X-Fi supports. You can also use generic profiles too. All of the above pertains to the Super X-Fi’s ability to improve stereo content but the other big selling point is positional audio, which is marketed as being comparable from a Dolby Atmos setup. Really? Well, yes and no. While in a controlled environment set up by Creative, we found it hard to tell the difference... at times. But honestly, few who actually have a true surround sound system are likely to ditch it for the Super X-Fi. 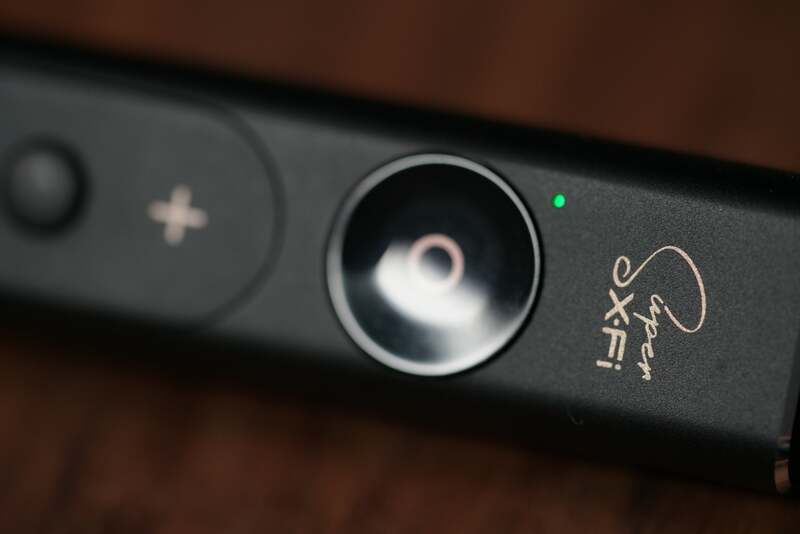 Still, if you want “Dolby Atmos” (hyperbole aside) in your ear, it’s going to be hard to beat the Super X-Fi right now. 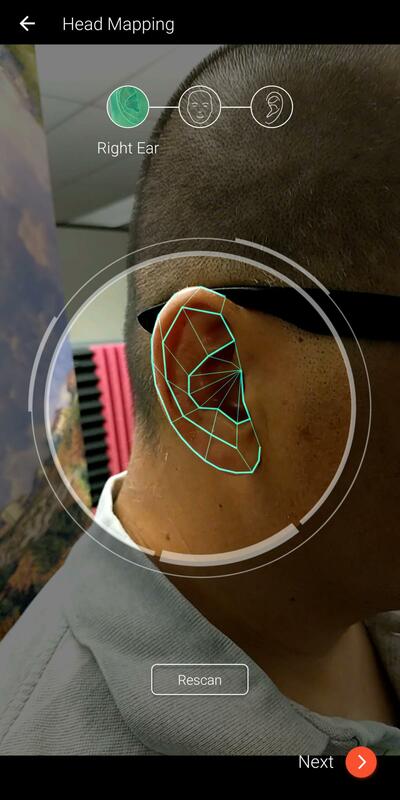 For our close-listening tests, we used the Super X-Fi’s profile generated by taking pictures of our head and ears combined with the profiles for the in-air Aurvana Trio and E-Mu Teak headphones, respectively. 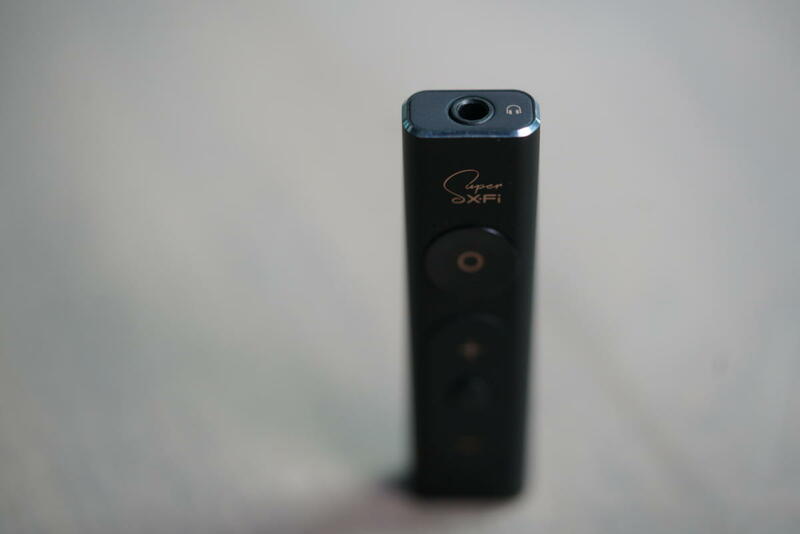 What’s cool about the Super X-Fi is that it functions as a basic USB Audio 2.0 device. 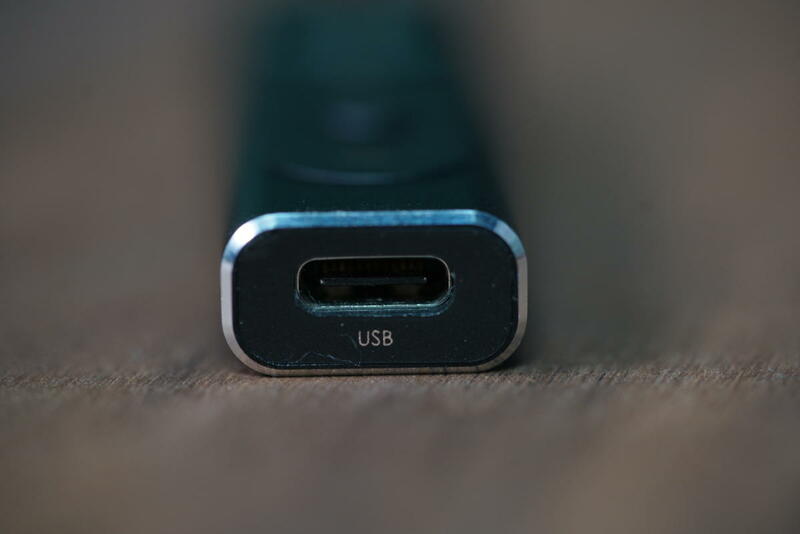 That means anything that supports USB Audio 2.0 should technically work with the Super X-Fi. On the PC there’s one more trick you perform. 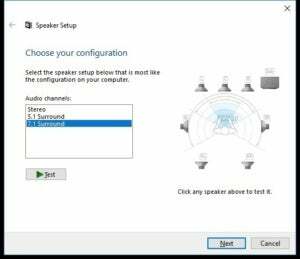 Rather than let it default to a standard two channel audio device, you set it to 7.1 audio in the control panel. This lets Windows spit out eight discrete channels over USB, which the Super X-Fi then processes back into surround audio. In our close-listening tests we used the oldie-but-goodie RightMark 3D Sound, which lets you carefully position an audio source around you. One end, of course, features a standard 3.5mm “courage” jack that’s been banned by most phone companies. 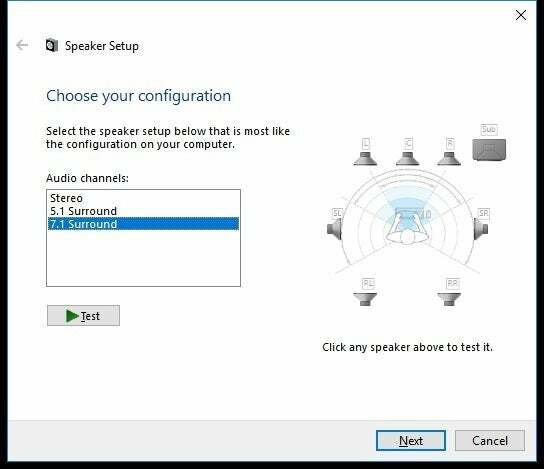 To replicate our RightMark 3D audio test, but with some control, we first used a 360-degree recording with an integrated 5.1 audio track using the Google Chrome browser. For the video, which you can see here, a 360-degree camera was mounted on the turret of an M4 Sherman tank at the Thunder Over Michigan 2017 show. Besides the thunder of machine guns and tumble of the Detroit motors, the audio includes several passes by a P-51 Mustang. That let us rewind the video and repeat the P-51 pass using the Super X-Fi on and off, with the ability to “move” our virtual heads in the video. The result? Far better positional and far better immersive audio. Would we say we felt like we were a GI on the front of a Sherman? No, but it certainly sounded more like it than pure stereo output. This, again, seems to be the strength of the Super-Fi: to render what would be pretty mundane audio into far more immersive audio. Another video we used for listening tests featured the repeated flybys of a Huey UH-1 helicopter (which you can see here.) Switching off the Super X-Fi made that large rotor whop-whop-whop of the Huey sound dull and lifeless. Turn it on though, and the device adds just the right amount of reverb and touches to, well, make it feel like you are about to land in a hot LZ along with Four Leaf Tayback and Sgt. Lincoln Osiris during the Wet Offensive. It’s not just YouTube videos, of course. We also used CyberLink PowerDVD to closely listen to James Cameron’s Avatar on Blu-ray. Say what you will about the movie, the audio mastering is well executed. We used one particular Na’vi scene where the characters fly past waterfalls and we could clearly hear—or at least we believed we heard—the waterfalls behind us. And that’s the thing. Over the years, we’ve wondered if positional audio isn’t more the the power of suggestion than the power of HRTFs, reverb, and other audio filtering. You are, after all, using two channels to fool your brain into thinking something is behind you, or above you. We’ll let the audio nerds argue that in forums, but what we can say is the Super X-Fi really does a damned-good job at making you believe it and that is really all that matters in the end. As good as the Super X-Fi is, convincing consumers this is something they need is still an uphill battle. Again, we believe that most of the time, you’ll find the rendering of the content that you listen to vastly improved. That runs the gamut from your FLAC files to MP3s and, yes, YouTube videos of WWII-vintage warbirds taking off. But do you care enough about the audio from your laptop, phone, or desktop to invest $150, along with purchasing a decent pair of headphones, and then deal with wires too? The truth is, we know few will do that, instead favoring Bluetooth. And that’s a real shame because we can honestly, and unabashedly, say your ears are missing out without the Super X-Fi. 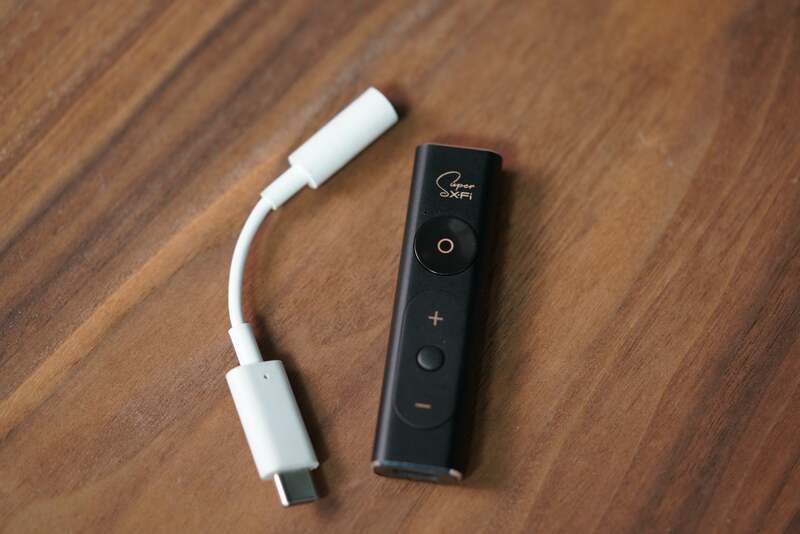 Once you set the Super X-Fi for your headphones and head profile, the USB-C jack and USB Audio support means you can take it just about anywhere with you and immediately enjoy less oppressive audio.